Synopsis: Two corrupt cops attempt to get their hands on the proceeds from a botched robbery. There’s not much escapes War on Everyone’s irreverent sense of humour – mime artists, British nobility, black men, fat kids, homeless kids, bald jockeys, suicides and more – British writer-director John Michael McDonagh fires wide and loose and catches them all in his scattershot delivery. Anyone under the age of, say, 45, will probably be mortified, but those who recall a world before it seemed like everybody was in a permanent state of readiness to take offence at the slightest thing on the grounds of their race, gender or sexuality will recognise the kind of flip irreverence to be found in War on Everyone for what it is. It’s a comedy of exaggeration that recognises and ridicules the level of artifice and hypocrisy in the world today. 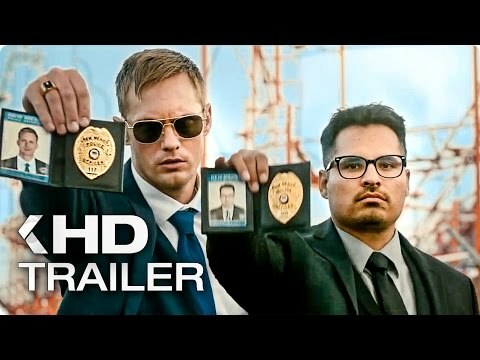 Michael Peña and Alexander Skarsgård are our two comic anti-heroes. Bob Bolano (Peña – American Hustle, Ant-Man) is a married father who keeps no secrets regarding his corruption from his gorgeous, loving wife (Stephanie Sigman – Spectre) and is relentlessly rude to his kids; Terry Monroe (Skarsgård – Zoolander 2, The Legend of Tarzan) is an unrepentant alcoholic so befuddled by booze that he regularly broadsides every car parked on his route. Together, they make a formidable duo dedicated to tracking down criminals and parting them from their riches. Latest loot on their radar is the proceeds from a botched robbery on which their informant, Reggie (Malcolm Barrett), acted as getaway driver before absconding to Iceland with what Bolano and Monroe believe to be one million dollars. That’s reason enough for them to follow: Iceland’s a small country with a tiny black population, so all the cops have to do is stand by a landmark long enough for Reggie to come to them. The trail then leads to dissolute British horse breeder Lord James Mangan (Theo James – Divergent, Underworld: Blood Wars) and his effete sidekick, Birdwell (Caleb Landry Jones – Contraband), both of whom are understandably reluctant to let them have their share of the money. 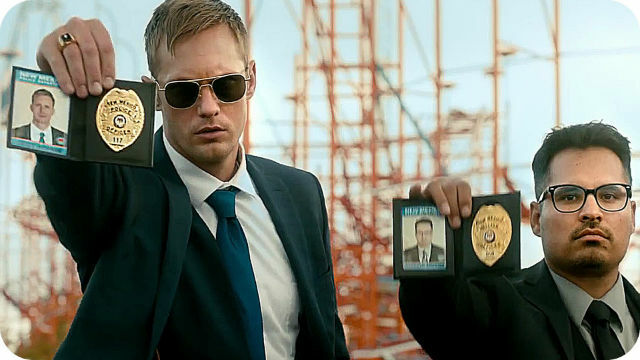 Skarsgård, who won his role after McDonagh saw a video of him drunkenly attempting to stir up the crowd at a football match, slowly assumes control of the movie from Peña thanks to the script’s uneven focus and a sub-plot involving his relationship with a young homeless boy and a young woman. His sudden acquisition of a surrogate family goes some way towards explaining the softening of Monroe’s abrasive character, but not that of Bolano, who, despite standing next to Monroe, recedes so far into the background that the casting of Peña begins to feel like a waste. On the other side of the law, James and Jones surpass the stereotypical nature of their characters to provide watchable bad guys.